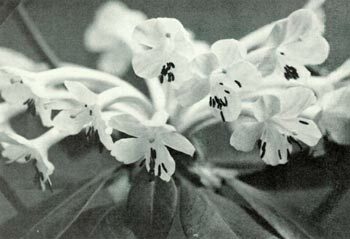 The Vireya rhododendron, R. goodenoughii , subsection Solenovireya , is listed as not known to be in cultivation by the R.H.S. 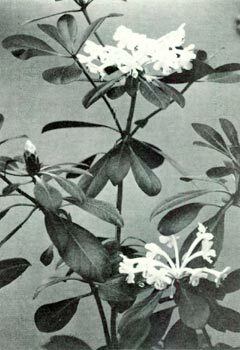 Rhododendron Species Handbook (1980). My plant was raised from seed sent to Mr. Maurice Sumner from New Guinea about fifteen years ago. This plant is trying to be a small tree and has bloomed for the first time. 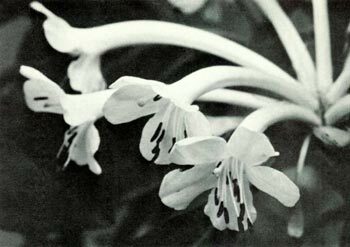 The white fragrant flowers are long tubes 10 cm in length and are 2.5 cm across distally. The truss in the picture contains 20 flowers in a very loose terminal truss. The dark brown stamens, 10 in number, contrast nicely with the white unspotted flowers. The shiny heavily textured smooth leaves, oblanceolate, are 14 X 7 cm. Perhaps this species could be kept smaller by its container size, but as I grow it it will be too large for other than a big greenhouse. Seed will be available, at a later date through Mrs. Esther Berry.